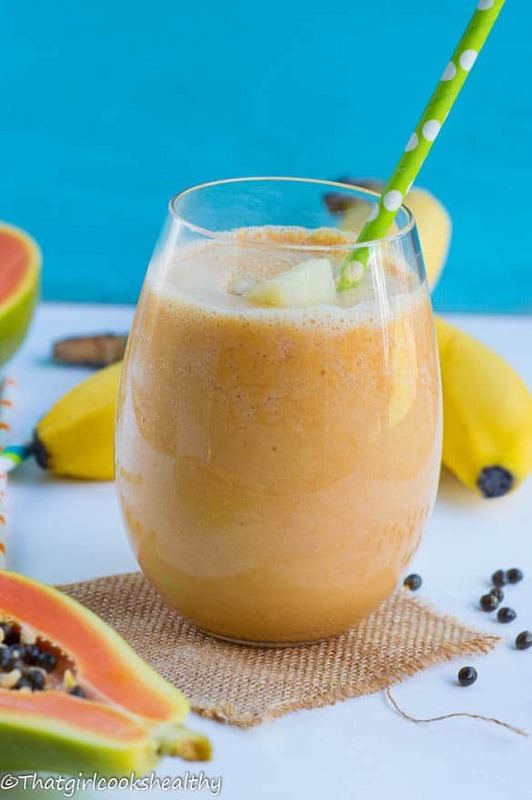 Papaya and pineapple smoothie – a simple, quick and incredibly tasty dairy free thick smoothie that’s made with coconut milk. 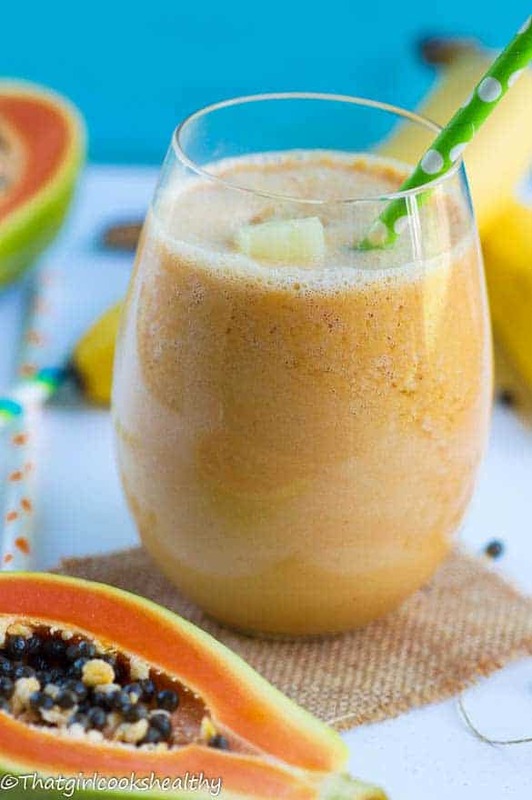 If you haven’t tried papaya before then I highly recommend whipping it up in your next smoothie. Right now is the peak season for papaya and if you’re fortunate enough to live in a country with much diversity, then you should be able to procure them at your leisure. Where I’m located in the UK provides me with the advantage of consuming the exotic fruits and vegetables that I grew up on with papaya being one of them. 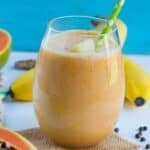 Although this papaya and pineapple smoothie contains more than just papaya, I want you guys to at least sample it, even if it’s just one time. With that being said, the papaya combined with banana, coconut milk and pineapple yields this nectar sweet taste of paradise. It’s filling yet great for aiding weightloss. C’mon what are you waiting for? Let’s make an awesome vegan smoothie!! Add of the contents to a powerful blender and blitz into a smooth consistency. Hi Shellyann, I’m SO happy to hear that. Feel free to try some of the other fruit based smoothies they are great for aiding weightloss too. I didn’t have coconut milk, so I used yogurt and a bit of water. It was delicious! Hi Jenny, that’s not a problem. What’s important is that you managed to find a viable substitute and loved the results. The recipe calls for 1 papaya. So it’s a whole papaya for this recipe? Sorry how many servings does this recipe produce? Thanks. Hi Roxy, serving is 1-2 people. I really love this smoothie it is so good, can also add spinach and ground flax seeds even better….try it you’ll love it! Thanks Darlene. I will incorporate some flax and spinach next time.